I don’t normally do product or restaurant reviews. But maybe I should. And although I have several other posts in draft format waiting for final touches, I just had to share this one with you. If you don’t live Nashville, disregard, but if you planning to visit, read on. And then come visit. We love tourists’ money vistors! At the intersection of Italian restaurants from my past, I have discovered Vito’s. After promising some of the guys at work that I would go to lunch with them (and drive us in my convertible), it took me a while to finally get around to scheduling it. I had limited time for lunch so I asked them to pick somewhere quick. They suggested Vito’s. I had never heard of it (shocker I know! ), but they said it was buffet (quick) and Italian (yum!). So I pointed my car towards 19th Avenue and Hayes Street. I quickly discovered that Vito’s is in the old DaVinci’s location. Oh how I fondly remember eating pizza at DaVinci’s back in high school and college. A Mona Lisa please. Or maybe a Bella Vita. But DaVinci’s closed at the end of last year. Sigh. But I admit I haven’t been there in years. 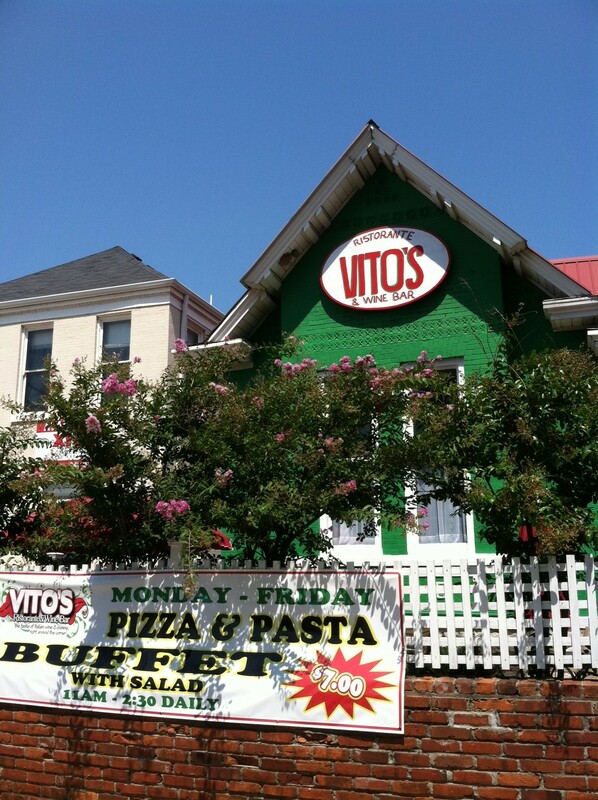 After entering Vito’s, we were quickly seated and greeted by a waiter who took our drink and salad orders. In addition to the buffet, you get either a field greens salad or a Caesar salad. But this is no ordinary Caesar. It has the standard romaine lettuce, shaved parmesan, dressing and croutons. But it also comes with Kalamata olives (no pits yay!) and sun dried tomatoes. But the kicker was dollops of goat cheese also spread throughout the salad! Brilliant! Oh the creamy surprises hiding underneath the crunchy lettuce. That salad alone was worth the drive down there! I can never have a Caesar anywhere else again! The buffet was modest, but delicious. There were various pizzas to choose slices of pepperoni, veggie, sausage, supreme. There was some kind of beef dish (sorry, I didn’t look closely since I ignore the meat dishes) that looked like pepper steak or some sort, as well as what appeared to be chicken fettuccine alfredo. What caught my eye most was the stuffed shells and another chafing dish of garlic bomb rolls. If you’ve ever been to a real Italian restaurant here, you know what I mean. Oh wow, those rolls. So, as soon as I saw the buffet offerings I was immediately reminded of the old Caesar’s Italian Bistro. Caesar’s also closed back at the beginning of this year (maybe a month after DaVinci’s). Caesar’s had the best lunch buffet with very similar offerings, fairly quick and reasonably priced. I mentioned this to my coworker and guess what?! It’s the same family! Now I can have my Caesar’s in the old DaVinci’s location (a much more convenient location to my work). A fantastic find! I only made one trip to the buffet with my small sized plate and that was more than enough for me (a rarity). But I think I could live on the salad and rolls alone and be happy! The entire bill was $7 with a water for drink. Not a bad and very fast lunch!! I’ll definitely be back. They also have a full menu at lunch with the traditional Italian fare and pizzas. Their dinner menu looks fantastic and they have quite the wine list as they also bill themselves as a wine bar. Today’s lunch was my first visit, but I do plan to go back for lunch and to try out the dinner sometime. Their menu also states that they have carry out, delivery, and catering options as well. I’m thrilled about this new addition to midtown Nashville. No, I did not debate the merits for or against hamburgers. And no, I did not eat a hamburger. But my friend Coco has been running this local “Burger Debate,” and I find it fascinating even if I don’t eat burgers. 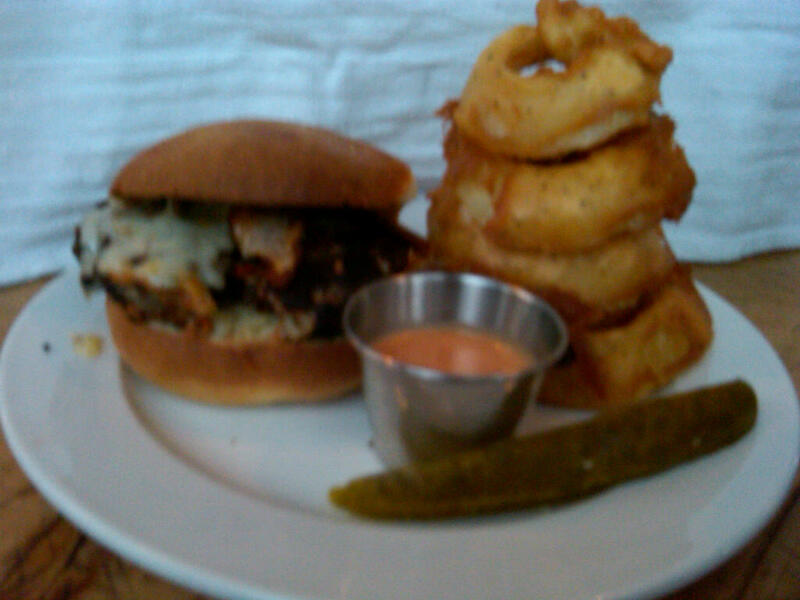 So, recently she added the new local, (way) upscale joint Burger Up to her list for Burger Debate. I have been wanting to try it for some time, because it is owned by the same people who run one of my favorite local coffee shops, and I’ve heard lots about the veggie burger. It helps that I got a glimpse at the menu and it looked fantastic. So, I added myself to her list and promised to help out with the Veggie Burger Debate end of the taste test! That evening, I also had another foodie event at one of my favorite local Italian restaurants. We had plenty of wine and some amazing food. I was able to catch up with or meet some of my online foodie bloggers that I love! Among the food that I loved was the flatbread pizza with portabellos, brie, and some kind of light mustard sauce, as well as a chick pea cake thing that was fantastic. I wanted more, but I knew I had to save room for burgers. By the time we arrived at Burger Up, I knew that unfortunately I wouldn’t have room to try the tasty appetizers, but I’ll come back and try them next time. Everyone ordered and we were on our way. 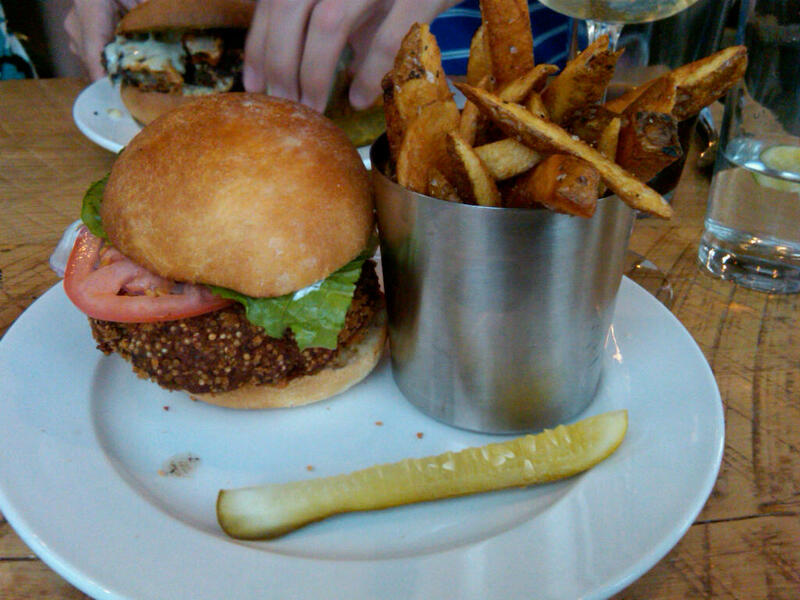 I, of course, ordered the Marathon veggie burger that is made with quinoa and black beans. (2 of a veggie’s favorite things) It was a whole lotta burger! I was completely stuffed by the time we left. The bun was good, but it was pretty thick and took away from the burger. The burger was incredible, don’t worry you won’t go home hungry it was very filling. However, I wished it had more condiments on it. It was an interesting touch that they put what seemed like sour cream on the bun, but there wasn’t enough. Turns out it was a “cilantro lime creme fraiche,” but it didn’t taste like anything other than sour cream. It was pretty dry and I’m somewhat of a mustard lover, so I could have used a little spicy mustard or some sort similar addition. The fries were incredible and the ketchup that they bring is homemade, so very nice too, but not exceptionally different from other ketchups. Then again I’m not much of a ketchup girl. Beloved ordered the Woodstock burger and the onion ring tower. The onion rings were really good. He only let me try one bite, so you know they were good, no sharing. He said the burger was pretty good. Maybe in the top two or three he’s tried. The sauce that comes with the onion rings was phenomenal. Probably my favorite part. I kept dipping my fries into it. According to the menu it is a spicy lemon lime remoulade. It is yummy, that’s what it is!! However, after our dinner, I experienced a bit of indigestion the entire next day. Apparently I wasn’t the only one. At first I assumed it was from the double-duty foodie night. But others from our group, friends who also dined there earlier that night, and other people I know who’ve eaten there before have experienced this. It was nothing terribly uncomfortable, and certainly nothing that would prevent me from trying it a second time. Speaking of, I would like to go back and try their portobello sandwich….and their fried shrooms…and….and…. I have heard that many diners experience very slow service. We had exceptional service, especially since we had a large group. That may have been the product of growing pains of a new business, that had been worked out by the time we arrived. The only complaint I had was the noise level. The layout of the restaurant is beautiful and I love the decor, but it does not do much for the acoustics. But I have heard the owners are working on fixing that in the near future, so that’s a bonus! Today is a special day for foodies and people who like to eat. Yes, that means you! While most of the flood waters have receded, people and businesses are still working on rebuilding. While not everyone has the time or money to donate to help out others, we all need to eat, right? Why not visit any of the wonderful local restaurants that are donating 50% of their proceeds today to the Tennessee Emergency Response Fund of the Community Foundation of Middle Tennessee? That’s right, 50%! Most restaurants are only participating for dinner, so check the details carefully. For the most updated lists of participating restaurants, please visit a couple of my favorite blogs and websites. The owner of Amerigo, one of my favorite local restaurants, organized the event. It is also where I met Beloved 6 months ago today, so naturally we are going there tonight. Where are you going to eat? Heat olive oil, garlic, lemon pepper, Italian seasoning, garlic pepper in large frying pan. Add lemon zest to taste, some wine, lemon juice. Then add the frozen seafood and cook according to packaging, making sure to cook down some of the wine. 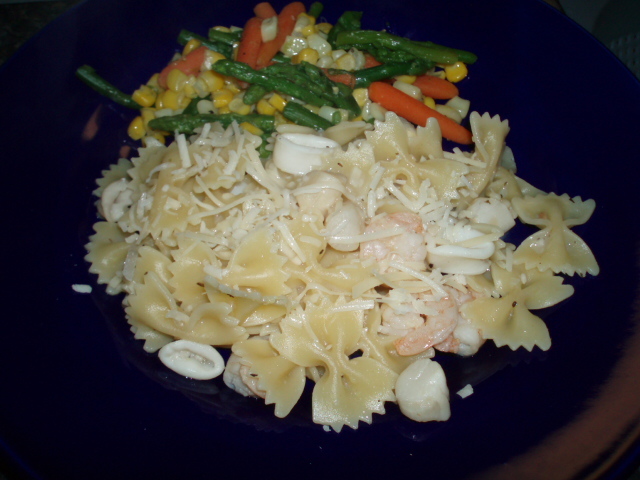 Toss seafood mix with pasta. Top with cheese, if desired. We survived the race! It was a very chilly start, just below freezing. But fortunately we had made a last minute trip to the outdoorsy store (coupon in hand!) and got some great cold weather pants. Barbie and I were in different starting waves, so I gave her a huge hug and some encouraging words before her first half and made my way to my corral. Though it was a fairly large race (about 20,000 runners), it wasn’t long before I away from the crowds and could comfortably find my own pace. We approached the Ambassador Bridge, which turned out to be a pretty manageable incline despite my fears. Once crossing the bridge, we were in Canada. I’m officially an international racer! It was a beautiful run the entire race, great scenery and interesting urban landscape. It was around mile 5 that I realized I forgot to put Body Glide on my feet and I worried about blisters the rest of the race. Fortunately, I didn’t develop anything awful. Maybe my socks were already saturated with the stuff. The tunnel back to the U.S. turned out to be the worst part. It is the only international underwater mile (once again an international racer). A mile means I’m in the tunnel for about 10 minutes. It was a different climate in the tunnel and I really began to stifle from the heat and other runners. Fortunately, we reached the end of the tunnel and entered the U.S. again. Of course, as I exited the tunnel Green Day’s “American Idiot” began on my ear buds as if on cue. I promise I have my music on “shuffle” when I run. The rest of the race meandered through downtown Detroit. I felt great throughout the whole race. Somewhere in the last third of the race, I realized I was on track to best my last finish time for a half. So that encouraged me to keep going. In fact I finished in 2:15:05, almost a full 15 minutes faster than my first half! I’m very pleased. I trained hard enough and smart enough. I deserved it. I attempted to take pictures with a mini camera during the race. If I am able to download them to the computer, I will update with photos. After clearing the finish, I went back to the hotel to get warmer clothes to watch for Barbie at the finish line. I finally found her and we celebrated together. As I said before: Running 13.1 miles with your best friend…Priceless! I’m very proud of her, she had a great race, and really proud of both of us. Yay, Runner Girl Power! The best post-race celebration I think I’ve ever had included Pumpkin Spice smoothies at the post-race party. Wow, yummy! I need to start making those! Of course, the past couple days since the race we’ve been moving in rather slow or odd ways. Post race soreness is a funny creature. But nothing that a few glasses of wine or a few pints couldn’t fix. To battle our post race soreness, we hit The Honest Lawyer again tonight. Barbie did some of her grading, while I worked on some pro bono work. (Kinda fitting that’s a good place to work.) It’s my last night visiting with Barbie, but I’ve had a great trip! And a great break, that was sorely needed. I’ve been thinking a lot about feelings lately. But today I particularly thought about that feel-good feeling you get after running 8 miles. (Yes, an hour and twenty minutes of misery to get 10 minutes of endorphins). And how good the long shower after running 8 miles feels. I started my Sunday very early with an 8 mile run. Just seven more weeks until the big race, and four weeks until the 15k. After a few errands and house chores, I prepared some dinner with some of the bounty from my CSA. Ratatouille, garlic mashed potatoes, and salad with a glass of wine. Yum! Cut potatoes into small cubes. Add potatoes and boil for 20-25 min. until tender. Drain potatoes, add minced garlic, and mash. Mash until desired consistency, adding butter to taste and milk to desired creaminess. Cut up eggplant, yellow squash, patty pan squash, zucchini. Heat olive oil and garlic in large pan. Add eggplant and squash. Cook until veggies start to soften and release water, but not fully cooked. Cut up a couple small tomatoes and red bell pepper, and add to pan. Continue to cook covered until wine cooks down some and veggies reach desired level. We made a date to visit a local winery, to allow Shutterbug to take pictures and so we could test out the free wine tastings. It was a gorgeous day in a wonderfully beautiful and peaceful location. We packed some cheeses, chocolate, and other assorted goodies for a picnic after the tasting. It was such a perfect ending to my vacation. Perfect weather, beautiful scenery, good wine (maybe too much? ), good food, wonderful company, and fabulous conversation. One of the most frequent things complaints I hear from people who move here from other states (besides the infernal summers) is the fact that you can’t buy wine in a grocery store. Or any store other than a liquor store for that matter. On a related note, yes people complain that you can’t buy liquor on Sundays, but we have blue laws and this is bible belt, and like the infernal summers, it’s something we can’t change and you just get used to it. But we have been working on changing the wine in grocery stores issue. And one group in particular has been working very hard on it. Red, White, And Food is a group that is working on changing the law so you can purchase wine in Tennessee grocery stores. I know it would simplify my life to purchase my supplies for dinner (including libations) all in one store, or to show up at a Sunday party with that ever-so-crucial nice bottle of wine that I forgot to pick up the night before when the liquor stores were actually open. It’s a wonderful thing, in fact. You can buy beer, but that’s not always the best gift to a Sunday afternoon house warming or girls’ night. Why not wine? That’s their slogan and I certainly hope it sticks. March 2nd is the Red, White, And Food Blog Day, and I’m gladly participating. So click over to their website and see what it’s all about. Read the fact sheet. Visit their blog. Write a letter. Join them. Refer a friend. Or send your support in some other way. Why not wine?